After Samuel Granados, I’ve to compliment two other talented graphic designers that passed through our Density Design course: Francesco Franchi and Luca Pitoni (is also Ilaria Tomat still part of the staff?). They are in charge (Francesco is the art director) for the design of the magazine “IL – Intelligence in Lifestyle”, edited by Il Sole 24 Ore. The magazine received last week five awards at the well known Malofiej competition (17th edition), organized by SND – Society of News Design. Most of the infographics produced for the magazine can be seen here. 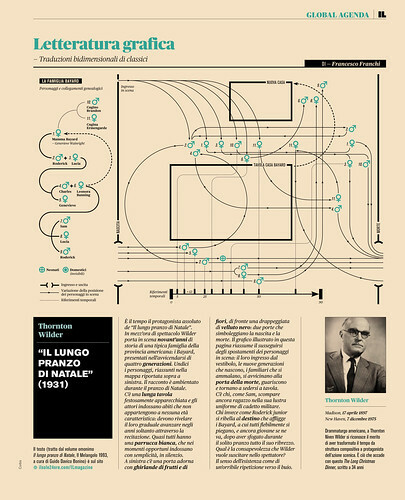 I like especially those called “Letteratura grafica”, a visual synthesis of classic oeuvres. They reminds me the work done by Giada Coppi in our course, and the thesys produced with the tutorship of Prof. Marco Maiocchi. The title of the thesys – discussed during the 2004/05 academic year – is “From words to images: graphic mapping of narrative structures”, in Italian: “Dalla parola all’immagine : la mappatura grafica di strutture narrative” (I hope my traslation is correct!). Also in our Density Design course we deal since some years with narrative structures, like the movies Memento and – just done this year – Jules and Jim. The non-linear and unpredictable structure of these movies is a good base for approcahing complexity and the construction of visual models. Coming back to Francesco, Luca and their awards, well done guys!